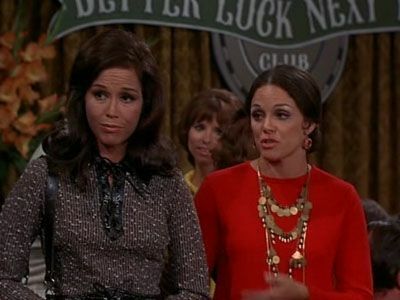 This week on The Mary Tyler Moore Show, Mary and Rhoda join the Better Luck Next Time Club, a group for divorced people looking to socialize and maybe meet a new spouse. Their reasoning? There’s supposedly cheap flights to Paris involved. Things quickly spiral out of control thanks to their little white lie, and Mary has to come clean about their deception. Along the way, Ariel and Silvia talk about the stigma of being divorced, the greater stigma of being a single 30-something woman, and the pressure to pair up. You can now find us on iTunes! Please rate the show, subscribe, and write a little review to help others find the show. You can also find us on Stitcher, Google Play Music, SoundCloud, and the Pocket Casts app. Follow us or shoot us a message on Facebook, Twitter, and Instagram, or by email at afterallpodcast@gmail.com. Logo design by Toronto artist Julia Monson.